A closer look at the datasets we had gathered in Germany confirmed that these first measurements were fine so we decided to carry on with the next phase of the campaign and move on to the Czech Republic. So, as of 30 August we have been in the Beskids mountains just on the border between the Czech Republic and Slovakia. We first had to set up all instruments in the forest to measure the more complicated fluorescence signal that comes from the trees’ pine needles in this hilly terrain. The Czech team starting to climb. The main challenge for the airborne measurements is that the instrument doesn’t just see the upper needles, but also the lower ones and we don’t know exactly how this will look from above. 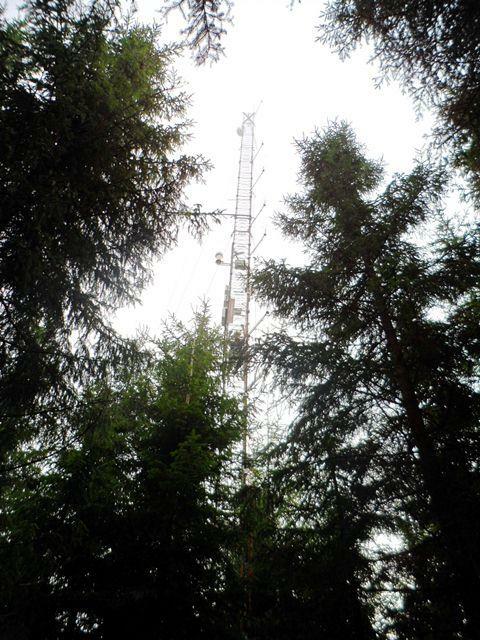 The other challenge is that the people have to measure in and above the forest. Taking the instruments from the plane is relatively straight forward compared to taking measurements from the ground. We have to use a tower 40 m high and a cherry picker. The first few days were spent installing the different instruments on the tower and on the cherry picker, which was really hard work. Installing the instrument on top of the tower. By Monday 3 September, we were ready and hoped to have the first test flight. We had a bit of a hiccup as we then discovered that we couldn’t fly over Slovakia as we didn’t have permission to take any pictures over the country. These things happen and a solution was quickly found and after a couple of hours the plane took off. 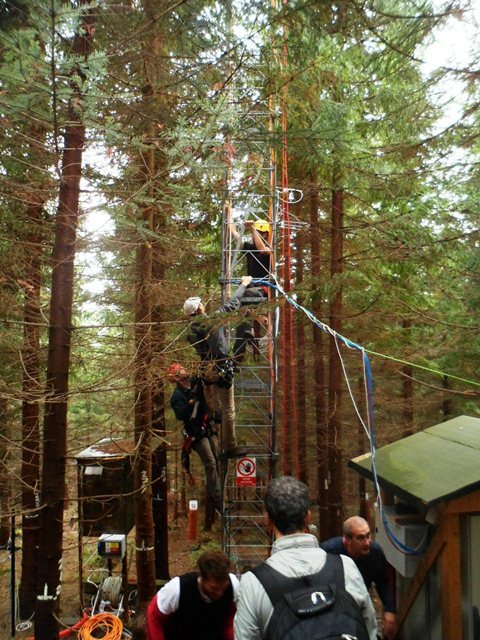 The Italian team operating their instrument above the forest.